(17/03/2016) Mensa Encore, Pulo Gadung – As the commitment to always enhance the quality of life, Landson PT Pertiwi Agung held the pharmacy symposium for the first time, with “The Role of Omega-3 in Daily Life” as the theme. The aim of this event was to educate and provide the health care workforce with the right understanding of diseases and the proper medicine to cure it. Came as the speaker of the event were Dr. James Hajadi (Corporate Medical Director), Mr. Hindrianto Lukas (Chief Marketing Officer of Mensa Group), and Mrs. Hernita (Marketing Manager of Landson). 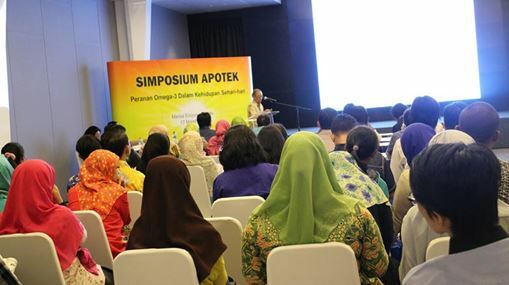 Regarding the theme, they presented to 136 participants who was attended the event, all about “The Most Trusted Ingredient of Omega-3” and the advantages and excellences of Landson Omega-3 products, which are CORMEGA®, PROZA® and ASTRIA®.